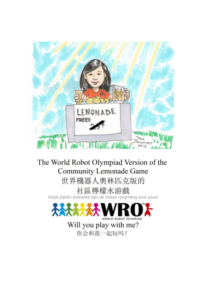 I’M PLAYING A GAME – The World Robot Olympiad Version of the Community Lemonade Game. 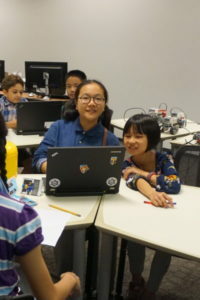 I’ve created myself a challenge to build community around the Southern California Qualifier of the World Robot Olympiad, that will be held by the Robotics Society of Southern California (RSSC). So the Gauntlet… the challenge… is to successfully execute the competition on August 11th, 2018. In my quest for community around the World Robot Olympiad, I have a number of goals: space, equipment, coaches, skills, materials, players. 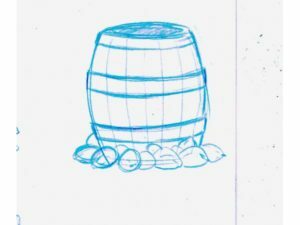 But I started another version of the Community Lemonade Game. A game within a game. The rules permit it, so – why not? You might ask which rule permits a game to begin from another? It’s the rule that says I can change the rules. There was a playbook, in English and in Chinese (using Google Translate) and in Pinyin, a Romanized spelling of the Chinese sounds. The Gauntlet is the Challenge. 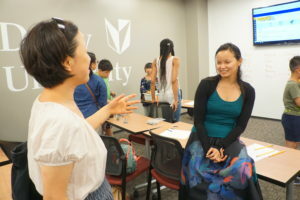 There was a Gauntlet – Learn English, Learn Chinese, Make Lemonade Game Items and Make Lemonade. There were Seekers – Game Players in the delegation, already in my community and those found via social media and friends. 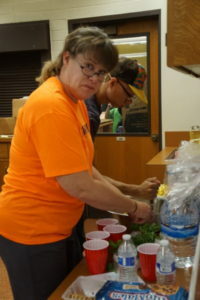 There were Items to find – Whatever I needed to find, but especially lemons, sweetener, ice, add-on herbs for making Lemonade on the Competition day. 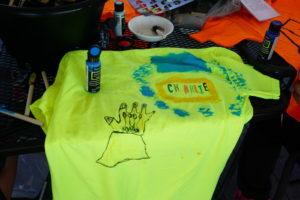 Metaphorically and physically, we made Lemonade. The tour group trained at DeVry University and stayed and was very visible in downtown Long Beach. Anchored at the Mariott, eating at the James Republic, PF Chang, Gladstone’s, the Fish House, 123 Pho. Visiting the Aquarium, Shoreline Village and taking a harbor tour. There’s a lot to do in Long Beach, it was just one sample of the offerings. 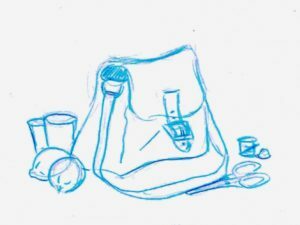 One Seeker painting the Satchel. Two Seekers working on the robots. 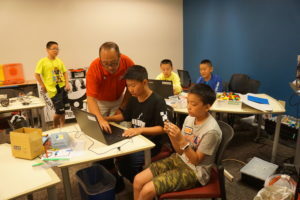 WRO-USA Organizer Will Wong making Lemonade, teaching kids about robotics at DeVry University with kids. Two Seekers helped to fix the table. 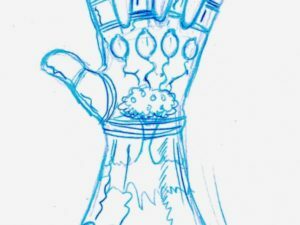 One Seeker drew the Gauntlet. 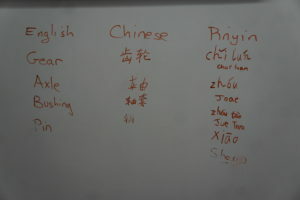 Seeker/Interpreter and Seeker/coach from Beijing. The Cookie dispensing machine became a cookie and lemonade dispensing machine. One team called itself Lemonade. Motto: When Life Gives you Lemons, Make Lemonade! So, Dear Readers, I ask you. Did I win the game? I think the evidence I provided makes it clear that the goals were all met to some degree. So yes, I succeeded in the goals we set, and yes, I can declare the game won. I know that you know that if the goals were not met, I could at this point adjust the goals (within reason to myself, as I share with you) and still declare the game won. It is how the game is played. 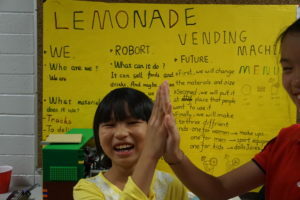 The team of Seekers worked hard to help accomplish the goals: Learn Chinese, Learn English, Make Lemonade Game Items and Make Lemonade. And that is what matters. 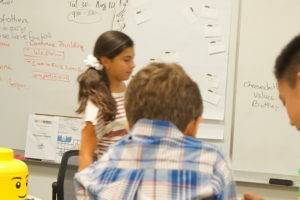 Finding the community to work on the mission, whatever that mission might be. There is much to the game, as you might now understand, and the possibilities are endless. But there is no need to adjust the goals. 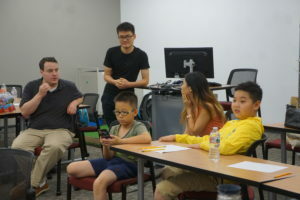 The team of Seekers worked hard to help accomplish the goals: Learn Chinese, Learn English, Make Lemonade Game Items and Make Lemonade. A community was made and will continue forward. And that is what matters. Finding the community to work on the mission, whatever that mission might be. And to Make Lemonade. To infuse those we encounter with positive thoughts, take opportunities, help others, help ourselves, share what we are doing as we do it, ask for help if we need it, to reach out via social media and in person and to focus on Community building even as we understand each individual’s personal desires, goals and needs (whether or not they say or realize those needs). To find new paths if the trail we are following disappears, and to always believe that to goal we are striving to accomplish can be achieved, even as new goals emerge. To persist. To understand the power of the internet and the tools that it provides to us. To keep playing the game, or to play a new one that might also emerge. To keep the big picture and the little picture both in focus at the same time. Dear Reader, did I win the game? 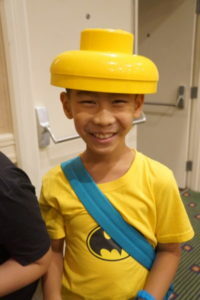 Did WE win the game? Is the game now ended? Dear Readers, one might ask whether the game is ended. I must admit that this question has arisen in my mental conversations with me, myself and I. 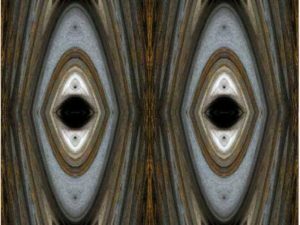 Does the game actually end, or is each definition of the game just another level in a very long game. I would call it The Game of Life, but that is taken, so I call it The Community Lemonade Game. Dear Readers, I’m sharing with you that the Lemonade is continuing to be made! A new team, formed from my group of 4 high school interns from the summer program, competed in the Robot Soccer (Robot Football) competition of the World Robot Olympiad. We’re calling them the American Girls. 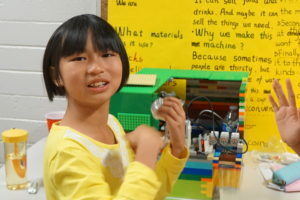 Our American Girls team, formed because of the internship from Long Beach Call, placed because of a vague goal from 2012 (establish tours from China) and a request from a Random Stranger in January, named because of our International and Multi-National competition format, is moving forward to the National Championship in West Virginia. 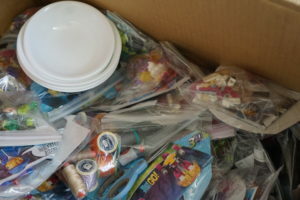 We will be doing fundraising to help them go forward. Perhaps we will do a Community Lemonade Game fundraiser. I would like to thank a few folks, groups and organizations. 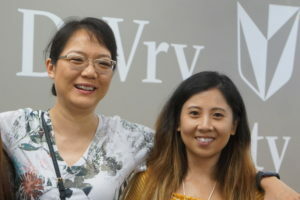 DeVry University, Long Beach, The Long Beach – Qingdao Sister City Association, the Robotics Society of Southern California, Will Wong, the WRO-USA organizer and Juniper Networks, and the Long Beach Call program for their amazing support in this effort. 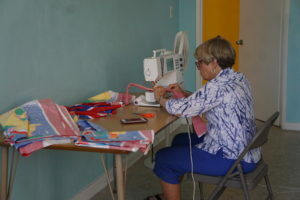 Trish is creating new communities. There is the International learning community, that we hope, in 2019, will be participated in by China, Trinidad, Japan, Mexico, Peru and the United States. 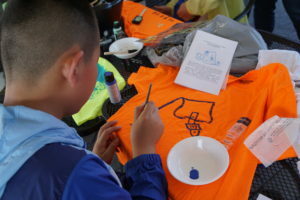 This community will bring together folks of different nationalities for 2 weeks, under the guidance of a US or International coach, educator or youth activity organizer. There is the Community Lemonade Game community (hm. redundant? Sorry!) Please join our group, like our page, and look out for us at random locations on the Internet. In the United States (my country) or in yours.